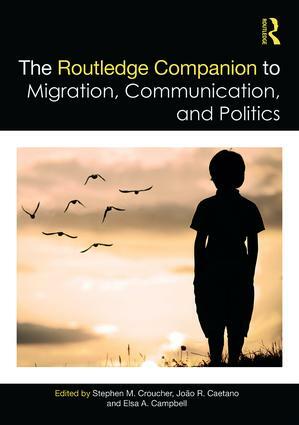 The Routledge Companion to Migration, Communication and Politics brings together academics from numerous disciplines to show the legal, political, communicative, theoretical, methodological, and media implications of migration. The collection makes the compelling case that migration does not occur in a vacuum; rather, it is driven by and reacts to various factors, including the political, economic, and cultural worlds in which individuals live. The 25 chapters reveal the complex nature of migration from various angles, not only looking at how policy affects migrants but also how individuals and marginalized groups are impacted by such acts. In Part I contributors examine migration law, debating the role of the state in managing migration flows and investigating existing migration policy. Part II offers theories and methods that integrate communication studies, political science, and law into the study of migration, including cultural fusion theory and Gebserian theory. Part III looks at how contemporary perceptions of migration and migrants intersect with media representations across media outlets worldwide. Finally, Part IV offers case studies that present the intricacies of migration within different cultural, national, and political groups. Migration is the key political, economic, and cultural issue of our time and this companion takes the next step in the debate; namely, the effects of the how, in addition to the how and why. Researchers and students of communication, politics, media, and law will find this an invaluable intervention. Stephen M. Croucher is Professor and Head of the School of Communication, Journalism and Marketing at Massey University, New Zealand. He researches migration, religion and conflict. He has authored 10 books, numerous book chapters and more than 100 journal articles. João R. Caetano is Professor of Law and Political Science at Aberta University, Portugal and Pro Rector for International Advancement and Legal Affairs. He researches migration, citizenship and European issues. He has authored more than 100 articles, book chapters and books in several languages. Elsa A. Campbell is a doctoral candidate in the Department of Music, Art and Culture Studies, University of Jyväskylä, Finland and coordinator of the VIBRAC Skille-Lehikoinen Centre for Vibroacoustic Therapy and Research. Her research focuses on the use of music and sound vibration in medical rehabilitation settings.